Sen. Sam Brownback says his association with Apostle Lou Engle is related to apologies for the treatment of Native Americans and African Americans. True! Brownback has taken part in NAR* "Reconciliation" events since 2003, and subsequently introduced Senate resolutions apologizing to Native Americans. These Reconciliation ceremonies are not about pluralism, but about proselytizing - for both charismatic evangelical belief and right wing politics. NAR repentance rituals are an evangelizing technique called "Identificational Repentance and Reconciliation," a weapon in the arsenal of Strategic Level Spiritual Warfare, now widely practiced by prayer warriors of the evangelical Right. Brownback's counterpart, and representing Native Americans in the rituals, is ICA* Apostle Jay Swallow, who specializes in "identificational repentance and high-level spiritual warfare." The ceremonies are linked to culture war issues including abortion and prayer in schools, and include demonization of Native American heritage, sites, and (claimed) destruction of artifacts. For those not familiar with NAR lingo, please persevere. This is a story that is worth the trouble and will hopefully answer questions about some of the unexpected alliances that are providing the Religious Right with political clout. 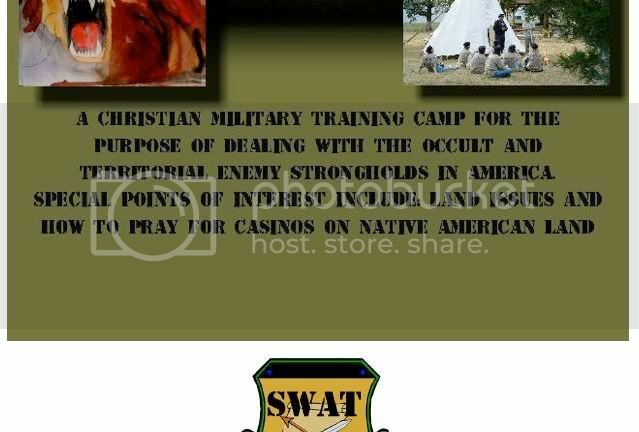 The first graphic below is part of a banner for SWAT, (Strategic Warrors At Training), described as "a Christian military training camp" led by Jay Swallow for teaching strategic level spiritual warfare. The second is promoting a mini-camp held by SWAT. To attend one must be a "Spirit-filled" or charismatic Christians and "have approval from your spiritual covering (pastor, elders, husband)." Swallow claims apostolic "oversight" over Native American tribes and to be representing these tribes in Reconciliation ceremonies held around the nation. He is a regular speaker and teacher for International Transformation Network which has been featured many times on Talk2action.org in relation to Uganda's anti-gay bill, Hawaiian gubernatorial candidate James "Duke" Aiona, and Pray Newark, with Swallow credited for playing a role in the latter. Swallow is founder of Two Rivers Native American Training Center and also serves on the board of directors of Chuck Colson's Operation Starting Line, the National Prayer Committee, and the Native American Resource Network. "They're good things. Those were the substantive items I worked with him on.... It has not been about other agenda items alleged." Like many activities of the NAR, the idea of reconciliation does indeed sound good... until you take a closer look. Sen. Brownback has participated in Reconciliation events with NAR apostles since at least as early as 2003. That year Brownback met in Washington D.C. with Apostles Cindy Jacobs, John Benefiel, Jay Swallow and others. Jacobs and Benefiel are authorities over prayer warrior networks which are organized by states, the Reformation Prayer Network and Heartland Apostolic Prayer Network, (HAPN) respectively. NAR leaders describe the event with Brownback as a major breakthrough for spiritual warfare in the country and for a 50 state tour taken by top tier Apostles Dutch Sheets and Chuck Pierce. Subsequently Brownback sponsored a U.S. Senate resolution and hearings were held in 2005. In 2005, Brownback appeared in a 2005 Transformations movie on Uganda which starred Apostle Julius Oyet on a mission to destroy the altars claimed to be the source of the power of the rebel group, Lord's Resistance Army. (Oyet was recognized by the Ugandan Parliament when the "kill-the-gays" bill was introduced.) The Transformations are a series of pseudo-documentaries produced from 1999 to the present, used as a promotional tool for NAR's strategic level spiritual warfare techniques. Uganda is claimed as one of the leading prototypes demonstrating the taking of "dominion" or control by charismatic evangelicals over government and society. The movies promote the ultimate faith-based initiative - they claim that once dominion is achieved, communities achieve reductions in societal evils including: corruption, crime, poverty, illness, and even miraculous healing of HIV/AIDS and environmental degradation. On March 1, 2007, Brownback sponsored a resolution in the 109th Congress apologizing to Native Americans. Resolutions were finally passed as S.J. 14 and H.J. 46 and signed by President Obama in December 2009. . Right Wing Watch has video and an explanation of the NAR- led "kettle tour" mentioned in Brownback's 2009 Senate testimony on an apology for slavery. This tour was led by Apostle Dutch Sheets and was described as an effort to "redig the wells for revival" and to "release a multiplication of power for spiritual breakthrough." A Charisma magazine article describes these reconciliation events in the benign terms of healing of the nation, as does the Senate testimony. However, in their own books and media, NAR leadership clearly states their intent - not just proselytizing individuals, but taking Christian dominion over government and society. What do Reconciliation ceremonies mean in the context of the NAR, and why are these congressional resolutions so important to them? As defined by NAR leaders, the term "Identificational Repentance and Reconciliation," refers to a spiritual warfare tool with the purpose of overcoming the resistance of ethnic, racial, and religious populations to converting to evangelical belief. NAR apostles claim that the resistance is caused by a demonic "stronghold," meaning demons have control over these populations, due to either sins that their ancestors committed, sins committed against their ancestors by others, or both. Names have been given to the demons that they believe control various ethnic or religious groups. For instance Native Americans are claimed to be under the control of Baal, Leviathan, and the Queen of Heaven. This last principality is claimed to also control Roman Catholics (non-Charismatic) and Muslims. Despite this literal demonization of Roman Catholicism there are Catholics working with the NAR apostles including Brownback and Hawaiian Gubernatorial candidate Duke Aiona. In order for the demons to be removed and to allow for mass conversions and the "taking of territory," there must be ceremonies of "corporate repentance" and reconciliation. The goals are clearly defined in the writings of those who popularized these strategic level spiritual warfare techniques. The term "Identificational Repentance and Reconciliation" was coined by John Dawson, an international leader of Youth With a Mission (YWAM). He founded International Reconciliation Coalition in 1990. Alaskan Apostle Mary Glazier, who founded the prayer warrior network which Sarah Palin joined at 24 (according to Glazier) and continues to meet with Palin, is an advisor to International Reconciliation Coalition. In a 1996 article in Renewal Journal, C. Peter Wagner announced that there was finally a text on Identificational Repentance - John Dawson's Healing America's Wounds - and that he (Wagner) required his Fuller Theological Seminary students to read it. Wagner was one of the leaders of a massive worldwide missions effort in the 1990s to evangelize the world by 2000. In honor of Dawson's book, their 1996 efforts were labeled "Healing the Land" and included spiritual warfare initiatives that would begin taking place all over the world including: repenting for massacres of Indians; repenting for slavery; and a "Reconciliation Walk" in the Middle East to apologize to Muslims and Jews for the Crusades. The latter initiative began in 1996 under the leadership of another YWAM leader and was modeled after John Dawson's book. As Wagner describes, the purpose was to tear down the "primary stronghold to blind the minds of Muslims and Jews to the gospel for centuries." It ended with a triumphant finale in 2000 in an amphitheater in Ephesus, Turkey. Ted Haggard helped organize the closing event at which "5,000 believers from 62 nations" including a 100-person choir from Korea celebrated "breaking the power of the Queen of Heaven" and a participating group proceeded to build a seminary nearby, as reported in Wagner's book Confronting the Queen of Heaven. "As the Body of Christ agrees to pull down strongholds of corporate sin, the way will be opened for revival of churches and a harvest of souls greater than anything previously imagined." Dawson is also an executive of founders of Toward Jerusalem Council II, an organization which advertises itself as "Repentance and Reconciliation Between Jews and Gentiles" but is actually reconciliation between Messianic (converted) Jews and Gentiles. This group of Charismatic leaders, NAR apostles, and Messianic Jews teach that if Christians befriend Jews and repent of the Holocaust, Jews will convert in large numbers, necessary "in order to hasten the coming of the Lord Yeshua." The group promotes Christian Zionism and has close ties to The Day of Prayer for the Peace of Jerusalem founded by Robert Stearns, a director for Christians United for Israel (CUFI). Brownback has been a regular speaker at CUFI events. Brownback said his interest in pushing through the Apology to Native Americans developed after talking with Senate colleague Ben Nighthorse-Campbell of Colorado, who is Native American, and reading books such as "Healing America's Wounds," by John Dawson, a New Zealander who founded the International Reconciliation Coalition, a group of Christian leaders with the goal of easing and redressing long festering societal wrongs. The ceremony seen in The Call Nashville video with Sam Brownback, Jay Swallow, Nigel Bigpond and Harry Jackson is quite tame, but other ceremonies around the country led by the apostles, shed light on the meaning of the ritual and what they expect as results. In 2007 a a "war council" was convened in Georgia including Apostles Jay Swallow, John Benefiel, Nigel Bigpond, and Diane Buker, head of Battleaxe Ministries. While a team of 40-50 worshipping warrior intercessors gathered at NE Metro Christian Fellowship to stand watch and engage in intercession, a team of state, regional, national and international leaders went on-site to fulfill the mandate of the Lord to wage war against the ancient powers that had been imbedded in the land as places of worship to Baal, Queen of Heaven, and Leviathan. The first stop was at the Cherokee's "Center of the Earth" monument near Hartwell, Georgia, where Ap. Jay led out in a prayer of repentance for the ancient iniquities of the Cherokee people who had inhabited the land in previous times and in intercession for the ensuing curses to be broken. of heaven for the divorce to be finalized. Additional reports came on the progress of the Resolution of Apology to Native Americans from the government of the United States. The House of Representatives has passed the measure as an amendment to the Native American Health Care Bill, which coincidentally, does not allow for any the affiliated federal funding to be used to perform abortions! This bill still must pass the US Senate, and remains a point of intercession. January 15, 2003 Dr. John Benefiel, Chairman and Mobilizing Apostle of OCOP, along with Dr. Jay Swallow, Dr. Neigel Bigpond, Jim and Faith Chosa, Gabriel and Vi Medicine-Eagle, Jean Stephenson, Sandy Grady and Mike and Cindy Jacobs met with Senator Sam Brownback in Washington, D.C. Dr. Benefiel explained to the Senator the curse brought upon our nation because of the 381 covenants the United States Government broke with the Native Americans. The Senator repented to the Native Americans right then and there. As a result of these events, Senate Joint Resolution (SJR) 37, (which will provide a formal apology from the United States Government to Native Americans), was written and is currently on General Order in the U.S. Senate awaiting a full Senate vote. ...Dutch Sheets began to speak and said that God had also spoken to him on his plane and told him 3 things to speak on that he had never spoken anywhere before... Then he said the starting of the 50 State Tour could not have happened until what happened in D.C. took place with the broken covenants and the repentance of Senator Brownback. Pierce claims other results followed. ...Prophet Cindy Jacobs commissioned Dr. Benefiel and Dr. Swallow to go to Arkansas and deal with the political spirit of this nation that hides out in Arkansas. In obedience to that word they led a team of Oklahoma apostles and Oklahoma and Arkansas intercessors on a strategic prayer journey April 12-14, 2004. They went to Little Rock, were they visited the state capitol building and took authority over Leviathan, Jezebel and political spirits. The team also went to an historic cemetery (where Albert Pike's family is buried) and the Clinton Library (which overlooks the Arkansas River). Then journeyed on to Hot Springs and addressed the spirit in the "springs." Lastly they visited a Jewish cemetery located at the beginning of the Albert Pike Highway and prayed and made prophetic declarations. ...We are praying and believing that all of Oklahoma (all the homes of the Red Men wherever they reside) will be saved and transformed. Sen. Brownback has strongly stated his objection to the healthcare reform law and says he will continue to fight it. In an effort to kill the bill, Brownback participated with Rep. Michele Bachmann, Sen. Jim DeMint and Rep. Randy Forbes in a "Prayercast" whose leaders included NAR Apostles Lou Engle and Harry Jackson. ( See Rachel Maddow's coverage of the Prayercast.) Most Native American organizations in Kansas support the healthcare reform law, nevertheless, in the first month after the Resolution for the Apology to Native Americans passed, Brownback's gubernatorial campaign received 14,000 dollars from tribal leaders in Kansas and New York, and many continue to support him. One has to wonder how many Native Americans in Kansas and elsewhere understand exactly what Brownback's friends have planned for them. The NAR apostles have organized national resistance to the healthcare bill through their state prayer warrior networks, but have several hundred faith healing and demon deliverance centers waiting for those are willing to have their demons expelled. ... by the strategies of the NAR apostles. It is disheartening to think of the potential damage that these misleading Reconciliation events could do to real progress in respect and tolerance between people of different races, ethnicities, and religions. The NAR's ceremonies have the potential to make other reconciliation activities suspect, even those without self-serving motives. Certainly some participating in NAR rituals may not be fully aware of these motives, but the leadership repeatedly spells out their intent in their books and media - they have no use for religious pluralism and their goal is dominion. Other religions are considered demonic and demons must be driven out in order to "possess the land." ...I don't really want to be suspicious of every reconciliation event, but unfortunately this is what happens when you've seen the deceptive nature of these NAR events. Another problem is a gray area that I'm encountering now that these ideologies are widespread - people who may get their ideas from NAR events, prayer walks, prayer networks, etc. but don't necessarily have the same underlying ideology or motives. It gets very confusing when you see churches copying some of these ideas like prayer walking without necessarily knowing the obsessions with demons and spiritual mapping that are behind it. In the case of Brownback's activities, it is very clear who he was working with, and since they are leaders, they have long track records and mountains of media documenting their intentions. I prefer the old-fashioned approach to racial reconciliation - workers of the world uniting to lose their chains. I mean, we know at this site that the NAR goal is to promote the "entrepreneurial" Uncle Toms like Mary Glazier into being the head negroes for each ethnic group at home and abroad and thus crush cultural diversity and class awareness. So it appears from the above graphic that the casino Indians fall into this category. The goal of the Right is ultimately to destroy the idea that ordinary people can organize to improve their earthly conditions by rational - non-religious - means. If ordinary blacks or Latinos organize strikes and vote in laws to do that, they won't throw themselves on the mercy of a God who only orders endless ceremonial acts, cargo cultism if you wish, to supernaturally bring earthly rewards. While the actual dispensers of those rewards are the Wall Street white elite who under the Seven Mountains scheme will bankroll God's spokesmen. When we had a union movement, Americans of different races worked together in the street to bring secular change. But the NAR is nostalgic for '30s falangism, Franco and Mussolini's model, where the poor are divided into rigid tribes who must defer to their higher-ups, uh, "faith covering", all the way to a top where the leaders are part of one big corporate board that writes God's script. This is not a problem for Brownback. Given the general intellect, (or lack thereof), of Kansans, his relationships with religious nuts will probably increase his electability. You may find my comment offensive, but it is accurate. If you want to persuade us that all Kansans are stupid, Dave, you will need to provide us with evidence. But before you try, you will want to consider that the Kansas Democratic Party has been making an issue of the Engle/Brownback connection. That alone may not win them the election, but they are not stupid, and feel that the matter is gaining them some traction. I neither said nor implied That all Kansans are stupid. I was making what I still believe is a valid generalization based on historical voting patterns, and you know that. There are theocrats in every town in this country, but their numbers are far more prevalent in some areas than in others, and you know that too. Now, I do concede that it might be useful to expose this in order to create friction between various religious conservative groups. Divide and conquer can be a very effective strategy. "This is not a problem for Brownback. Given the general intellect, (or lack thereof), of Kansans, his relationships with religious nuts will probably increase his electability. You may find my comment offensive, but it is accurate." You underscored that you stand behind your words by stating that people might find your words "offensive" and further indicating that you did not care because your claims were "accurate." Well if your words are "accurate" then clearly you think that Kansans enjoy a lack of intellect. Out here in cyberspace, Dave, all readers have to go on is the words we actually use, not the one's we wish we had said. ... is doing the nation a great service by getting this information out there. Regardless of the outcome of the election, this is an issue that needs nationwide exposure. Another thing that might surprise some readers is that most of the resistance to the NAR is coming from conservative evangelicals who know about the NAR and understand the threat to their own churches and doctrine. Most of what I have read by other authors about the dangers of dominionism, and almost everything published challenging the use of strategic level spiritual warfare and spiritual mapping, has been written by conservative Christians. As far as I can tell, most progressives, religious or not, remain blissfully unaware of the existence of the NAR and it's spiritual warfare techniques. They need to get what is going on in the papers and in front of the populace. They need to educate the PEOPLE, and not just their readers/listeners/members- although church members need to know too. I've never heard of "conservative evangelicals" fighting against dominionism except at T2A. Of course, I avoid anything conservative like the plague- I've had my fill of that way of thinking (Indeed, they invade the 'neutral' and even liberal-leaning blogs I've been on and just drove some of us away from another 'neutral' place that has nothing to do with religion or politics). Around this area, I swear they are supporting the dominionists* rather than resisting them. If they WERE fighting them, there would be letters to the editor decrying dominionist actions and goals. I've only seen a handful of letters over the last five years and even less 'speaking out'. Their church leadership needs to get involved and in public with their concerns about the Religious Right. Rather than that, you usually see "those horrible atheists are trying to force their religion on us!" rather than "separation of church and state protects everyone". You hear diatribes against evolution. You hear and read people insisting that the bible must be taken as literally true. This comes from "conservative evangelicals" as well as the NAR. IMO, there is little difference. In other words, if there are "conservative evangelicals" fighting against the dominionists/NAR they need to get it out into the open. They need to OPENLY join in the fight. They need to understand that support of the separation of church and state is the only way that we can legitimately resist the dominionists- and if they aren't willing to support that, then they are just as bad. I would tell them that the NAR is a logical extension of dominionism, as dominionism is a logical extension of Biblical literalism- and that there needs to be some REAL Bible studies taking place, not just "this is what is meant and how you should take it". Otherwise, we will keep having dominionist groups developing and trying to force their religion on everyone else. If those "conservative evangelicals" are fighting dominionism, I would suggest a public education campaign- using a little of their church money to take out ads in the papers and even public service announcements on the news... exposing what is going on and warning people about what they would REALLY be voting for. If they, as a church, are opposing dominionism they need to make it clear AS A CHURCH that they are concerned and that this is known to them at a organizational level (and not just something believed by individuals). Indeed, if there was money available, that is what I would suggest for EVERY GROUP fighting dominionism- public service announcements, letters to the editor campaigns, full-page ads in newspapers, and so on. People need to hear what's going on and believe me, they are NOT. *- I consider the NAR to be a subset of dominionism, and use the term to include anyone who wants to force their version of "Christianity" on the rest of us. fighters against dominionism were conservative evangelicals I met or whose work I read 25 years ago. At the time, Sara Diamond, Russ Bellant and I, who were researching these things, found ourselves on parallel tracks with historic Pentecostals who were deeply concerned and had been doing terrific research. We compared many notes and documents with one another. I have learned a great deal from books by conservative evangelicals who were concerned about dominionism. One such book, Dominion Theology: Blessing or Curse?, was an important source for me when I was doing research on Christian Reconstructionism. I cited material from this book in my 1997 book, Eternal Hostility. A few years ago, when Jonathan Hutson did his ground breaking series of posts at Talk to Action about the Left Behind video game, he was in contact with a number of conservative evangelicals who opposed the bigoted and violent messages of the game. His posts were also promoted and discussed by conservative evangelical critics on the web. Just because you don't know about such people, Bob, does not mean they do not exist. What concerns me is that I only hear about them in a few venues- pretty much only here (it has been mentioned in passing in a couple of other sites I've visited). We have to get this sort of information before the public and not the limited number of people who we already know or that have some knowledge of the situation. If there was a public campaign by the "conservative evangelicals", it might put a whole new face on the "fight" we are in and help us all. Even now, the struggle is usually passed off as a few conspiracy nuts against conservative Christians, and as I've said many times the general attitude (of people in the public) is "But it's a church, it can't be that bad!". We know better, but our public relations work and educational efforts aren't as effective as they should be. The problem seems to me that even though some of what we know has gotten before the more mainstream venues (such as NPR), most people- most of the VOTING people, don't have a clue because they get their news from TV and radio (often talk radio or the local music station) and sometimes from the newspapers. They may have seen or heard a news blurb about a scandal here and there, but not enough to see that there is a pattern. That's why it must get beyond the individual level and reach more of an organizational level (and go beyond writing books or papers or blog entries, although they are very important). If, for instance, the Methodists were to publish something in the mainstream media about the IRD (and showing the connections to the Religious Right and Dominionism), that would be something that would catch people's attention. I don't (and didn't) see that happening except WITHIN their organizations, and 'outside' is where we need to go. If there ARE "conservative evangelicals" 'out there' who are opposed to dominionism (and yes, I've read here several times about them), their rejection of this ideology needs to be known and not just to a few people. It might also make me feel a bit more 'friendly' towards evangelicals if they would do this too- not only me, but a lot of people I know. We still will disagree vehemently with their focus and pressure to convert people and even their theology and ideology, but at least we would know that we do share something in common and that they're actually opposed to using force for conversion. Right now, we can't tell and history suggests otherwise (ask Native America and other groups). Many of the people I know (outside of this blog) generally equate evangelical Christianity and Dominionism (and especially the NAR type flavors), or at least with the behavior we've reported as being connected with them. I think it would do a world of good if there was some evidence to the contrary- and not just what can be found here or on some blog. .. that are fighting dominionism, although I do not usually quote them on Talk2action. I have really struggled with this choice, but the reason I don't often quote them is because much of this material is in the framework of arguing about what Christianity is valid and what is not. I am wary about referring readers to material that does that, or that demonizes Roman Catholicism or Mormons, for instance. I write about dominionism because it is a threat to religious pluralism and secular democracy and therefore a threat to others, not because I am making a judgement about the validity of their belief. I totally agree that other conservative evangelicals, for the purpose of self-preservation, should be out there openly fighting against dominionism and standing up for separation of church and state. Unfortunately the constant fear mongering of the culture warriors makes it hard to break out of the ranks and admit that the greatest threat to many churches and denominations is not some imaginary army of militant atheists. Yeah, I know. I know the sorts of things you're talking about. We attend a UU church, and it's been publicly declared a cult by most of the churches in the area. If you know anything about cults (and everyone here does or should), UUs absolutely don't fit the bill (especially the bunch we're around). I've also heard what they say about my own people (Native Americans) and even about my own personal faith (Way of the Square Ground). I've seen what they say about other religions, and I know how distorted and wrong it is. Anyway, my point is that we need to get before the public to a greater degree... and if we have to encourage (meaning being supportive and not pressuring) them, then we need to do that. Right now, I feel as a little pressure is needed. Indeed, as much of a black eye that Dominionism in all it's flavors has given Christianity in general (my personal faith is a form of Christianity), I would think that they WOULD want to make it known that they are not like the dominionists, and try to educate the public on how dangerous dominionism is. It's not just a threat to them, it's a threat to everyone.